HexCam carry out aerial thermographic and high resolution visual inspections of ground-mounted and rooftop solar photovoltaic (PV) installations at all project stages – from ‘greenfield’ site topographic surveys and rooftop feasibility studies through to construction monitoring, project completion and provisional acceptance (PAC) as well as during the Operation and Maintenance (O&M) phase of a plant’s life. Aerial thermography allows solar system installers, operators and owners to carry out a detailed thermal inspection of 100% of the modules making up the plant and can pinpoint both module and Balance of System (BOS) faults that might otherwise be hard to detect from the ground and which may impact on the yield or safety of the plant. For large ground-mounted solar farms, aerial thermography offers significant time savings compared to walking the site and provides a fully reviewable and highly detailed visual and thermal record of the plant’s condition. All of our solar thermographic work is carried out in accordance with the requirements of IEC 62446 and will also satisfy the requirements of the forthcoming standard IEC 60904-12. 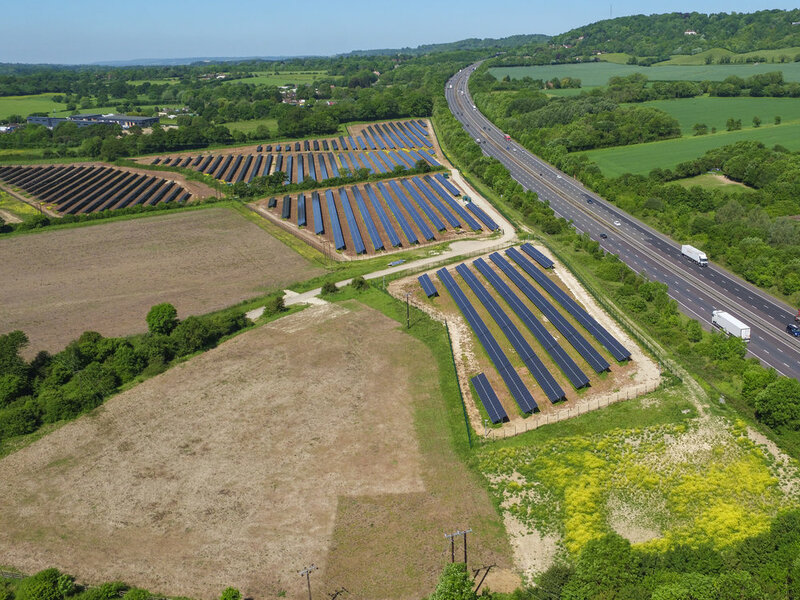 HexCam recently completed aerial thermography and subsequent detailed anomaly reporting for a 5MW solar farm for Everoze Partners of Bristol as part of due diligence for refinancing. The inspection covered 100% of the modules on the site and was commissioned to identify potential faults which might impact on the plant’s yield. The complex sloping site was split across a number of fields separated by tall hedges and mature trees and was also crossed by a number of 11kV lines. Add to that two major motorways running close to the site boundaries and extremely detailed flight planning and skilled piloting was required. Our drone-based fully radiometric Optris PI450 thermal camera working in parallel with a Sony HD video camera allowed us to identify potential open circuit strings as well as hot spots created by partial shading of some modules and to make recommendations for remedial action to be taken. Working at height can introduce significant hazards and risks for PV inspection and O&M personnel and can require the use of expensive access and fall-prevention measures. By using our drones for aerial inspection of rooftop and other building-integrated solar installations, the need for expensive access equipment and scaffolding is removed and the risks and hazards to personnel associated with working at height or on fragile roofs can be virtually eliminated. We have the in-house capability to carry out PV array condition inspections and reporting or we can work under a Client’s direction to focus on specific areas of interest to them. Our significant in-house PV solar experience means that we do more than simply provide you with GigaBytes of data and images and wish you luck. Depending on your needs, we can produce system condition reports detailing visual and thermal problems and anomalies noted during our inspection. We can pinpoint and categorise module and cell hot-spots, incorrect module clamping positions or spacing and poor cable management. We can give you our expert opinion on which issues will have the most serious impact on plant safety or performance and hence which require the most urgent close-up investigation and rectification. Drones can’t quite (not yet anyway) ‘kick the tyres’ during a system inspection, so we wouldn’t be able to tell you about loose electrical or mechanical connections unless these were clearly visible or led to a hot spot.